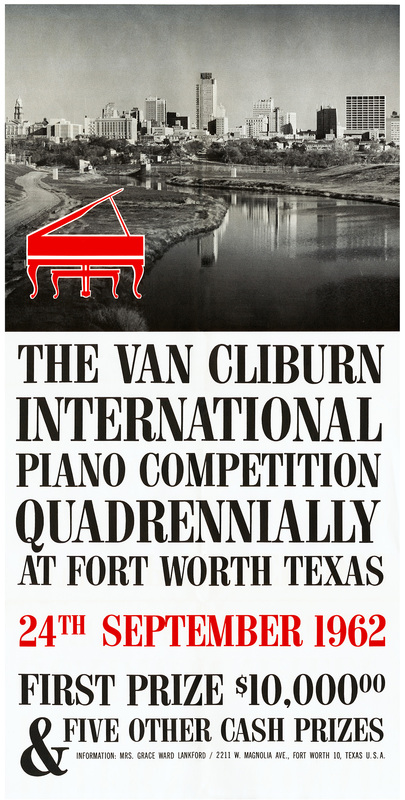 This exhibit is offered in connection with the Van Cliburn International Piano Competition Archive at Texas Christian University. Most images are clickable to enlarge or see complete items. For more on the competitions, see the archivist's Guide to the Van Cliburn Competitions. Exhibit materials should be used in accordance with copyright laws. Contact: l.ruede@tcu.edu. Also reflecting Van's Cold War capture of Russia's piano prize - and its people's hearts - is Stuart Isacoff's new book from Knopf. The TCU community can read the ebook online. Otherwise, portions can be previewed online at Amazon and Google Books. Van Cliburn's triumph in the First Tchaikovsky Competition in Moscow in 1958, during the Cold War, inspired the creation of a namesake competition, to be held in Fort Worth, Texas. Dr. Irl Allison, founder, listed most of the contributions Cliburn made to the competition. Moscow Nights, just out from HarperCollins, used materials from the Van Cliburn Piano Competition Archive and many other sources. Author Nigel Cliff takes us back to 1958, when Van Cliburn won the first Tchaikovsky Competition in Moscow, despite tensions between the U.S. and the U.S.S.R. Samples can be read online at HarperCollins and Amazon. Also just out from Knopf is Stuart Isacoff's When the World Stopped to Listen: Van Cliburn's Cold War Triumph. In a foreword from the 1962 competition program Van Cliburn spoke too modestly about his role in the competition's creation. Cliburn caused a kerfuffle, however, when he persuaded competition personnel to expand the number of contestants in both the semifinals and finals of the 1962 inaugural competition.